Today is an exciting day at Meraki HQ. Following months of hard work by our hardware and software engineering teams, we’re delighted to announce new additions to our switch and security appliance lines which will help our customers build larger, faster and more robust networks. Two factors prompted us to create new hardware. First, internet connections are becoming faster by the day, demanding ever-increasing performance from the networks that connect to them. Secondly, building larger networks introduces fresh challenges around network topology, cabling capacity, and performance. In 2015, all networks can be seen as mission critical, but inevitably this applies particularly to larger networks containing more equipment and supporting more activity. The network absolutely must be built to work around failure scenarios and deliver fast, seamless connectivity. To address these challenges, Meraki is introducing a powerful security appliance for the branch, and the world’s first cloud-managed range of stackable switches. Say hello to the new MX84 security appliance and the MS350 switch family. The MX84 packs a real punch, with double the performance and capacity of its predecessor. 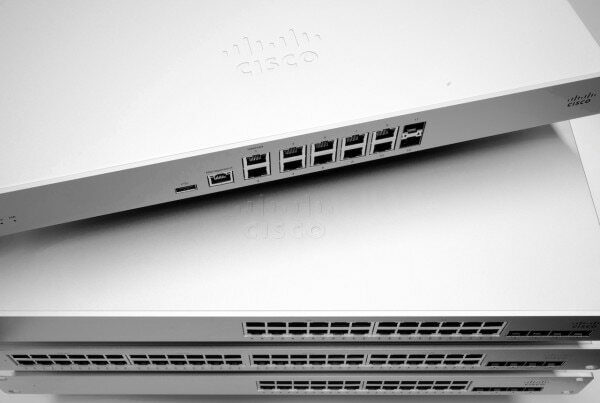 Port counts are up on the new model, with two dedicated WAN ports for active-active Ethernet/VPN WAN links. LAN connections have increased too, with 8 Ethernet ports (up from 4 on the previous model) and the addition of 2 brand new SFP fiber ports. Since the MX84 (and the other MX models) support dual WAN connections, it’s important to ensure that both connections can be used to their fullest potential. To that end, Meraki is announcing support for dual-active VPN connectivity and Intelligent WAN (IWAN) features. With Meraki IWAN, customers will be able to configure their security appliances to support automatic policy-based and performance-based routing decisions, ensuring more demanding applications get the bandwidth they require, and seamless failover in the event a VPN connection is dropped for any reason. Joe, our MX product marketing manager, will be back in a couple of days with a more detailed blog post covering these new capabilities for the product line. The MS350 line of physically stackable switches sets a new standard for combining power with simplicity. Delivering best-in-class performance and enabling resilient, full-bandwidth connections to the aggregation layer, the MS350 is ready for today’s demanding network clients, providing fast lane access to the server and cloud-based applications we increasingly rely on to do our work. Let’s take a look at the hardware. Under the hood the MS350 line boasts a more powerful CPU and more memory, helping the 350 support larger client device counts with the performance they require. From the front, the MS350 switches look almost identical to our existing line of Layer 3 switches, although those with a keen eye will notice a couple of design tweaks. Flipping the switch around, we immediately see just how much has changed at the back. The MS350 has a new, dedicated management port which provides access to the switch’s local management interface, so that this no longer takes up one of the ports on the front of the switch. 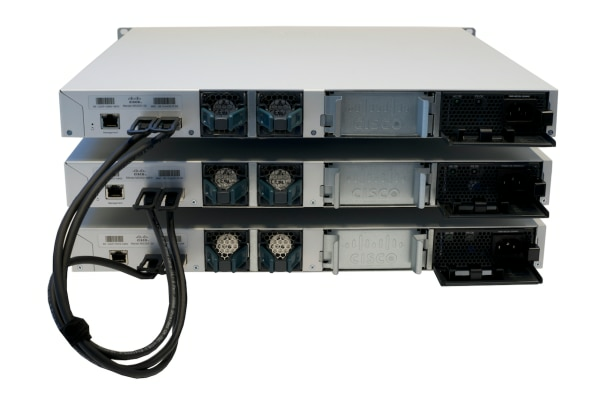 MS350 switches feature two built-in stacking interfaces, enabling up to 8 switches to operate as a single physical switch with up to 160 Gbps of stacking bandwidth. The new switch family introduces another enhancement for the access layer; hot-swappable fans in addition to the power supplies. Tomorrow we’ll be back with another blog post in which we’ll take a more detailed look at the stacking capabilities of the MS350 line, and how physical stacking works together with virtual stacking, a feature which we pioneered back in 2012, and which is a defining feature across the Meraki switch line.